I wrote this report three days after coming back from the Bago Yoma trip. There were ten people on the trip including three pastors from Tharawady Mission Association, one lady from the Karen Environmental Caring Organization, Kyaw Htet Lynn, who is the cameraman, Hay Thar, my uncle, my father, my wife, and myself. We rode the Bago Yoma’s mini-truck offered by Dr. Hanson Chen during the trip. Sin Zwe Village, one of the villages in Bago Yoma, is the mission field included under Tharawady Mission Association. We traveled by car, by boat, by cart, and on foot to get to the village. It took over six hours from Tharawady Township to Sin Zwe Village. It was a tedious and time consuming journey because of the mountainous and rugged land. In the rainy season, it would be very hard to travel because of the mud everywhere. It makes the business and traveling hard during this time. The roads are just not good enough to maneuver during the rainy season. There are about seventy houses in the village. Once there were many traditional Karen animists, some Baptist Karen Christians, and some Roman Catholics in the village. Currently, only thirteen families are remaining to be the Christians because of the intermarriage with the Buddhists and there seems to be a monastery in the future. The houses in the village are pretty big for the family living but most of the families rarely own more than five thousands kyats, which is about $5. The paddy farms owned by each family can rarely support the family annually. For most of the households, it is not enough to earn the living on the farms. Therefore, they have other small business such as making charcoal, hunting, selling bamboo stems, raising livestock and cultivation, and doing hard labor. The maximum wages is two thousand kyats per day and it is hard to get a job like this. The biggest problems in Sin Zwe Village are water and education. We have been solving these problems with the donations from the organizations and help from the volunteers. Water is scarce during the summer. Villagers could not pump up enough water from the aquifers or from the well. There are four major wells and everybody has to wait many hours for refilling water for their daily use. Some would think of making a dam or having the tube well. I convinced the villagers to make the tube well since Thra Taw Lu has bought some pipes from the donation of Friends of Burma from Mr. Amanoski. This makes it possible for us with my uncle accompanying me in drilling and making the tube- well for the villagers. Taw Lu has bought four inch PVC pipes and now they are trying to dig three wells. They have failed drilling for the water in Sin Zwe because of the lack of experience and skills. They cannot dig more than 30 feet. However, they have made success drilling in Late Pote Village with the donation from David B. Nelson. The well goes more than 100 feet deep. Therefore, Sin Zwe village is still facing water shortage for the villagers with their plantation and cultivation. The water quality is not good enough to drink but they have it anyway. For the future of Sin Zwe village, having education available for all kids is very important. There is only one primary government school in the village. In the mean time, there is only one teacher there. He is spending time in that isolated village and spending time teaching the whole year. Discontented with his status and career, sometimes, he drinks a lot even in the classroom. 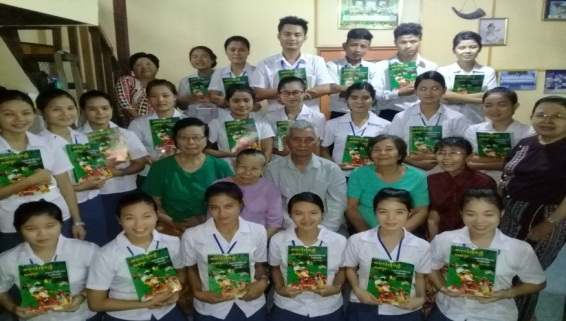 Last year, a lady, called Naw Yo Yo from Tharawady Mission Association, spent a year helping in the education, healthcare, and church activities. She receives 30,000 kyats. Yes, that is $30 annually. First, she decided to work only one year but now she decided to work another year there in the love of Christ. She was graduated from Karen Baptist Theological Seminary (K.B.T.S) and got her M.Div degree. She was a gift from God for helping out the villagers. All the kids in the village cannot read well in the fourth grade. However, because of Naw Yo Yo’s effort and energy into these kids, there is a sign of development in the education. Many parents were not used to be very supportive in education but now things have changed because of teachers like Naw Yo Yo in the village where they started to see the future of their village in their kids invested in education. Therefore, they warmly welcomed Naw Yo Yo and help her in the living. Still, they are facing the problems to provide enough for the teachers and the students with teaching aids, school support and equipment. Late Pote Village is located farther away from Sin Zwe Village, but we can see that it is a more developed village than Sin Zwe Village because Naw Ka Lu Paw has been devotedly serving for five years there. She is also coming from Tharawady Mission Association and was graduated with a B.Th from K.B.T.S. Even though she wants to continue her M.Div, she stays because of her love to the children and villagers there. She has been taking care of all the responsibilities for the villagers in healthcare, finding job, standing for the rights of the villagers, and working in the community activities and church work. She is a brave one. Whenever the village is being raided by the act of the Burmese bandits illicitly taking away the woods, cutting down trees, killing the forest keepers, and threatening the villagers; she would stand to protect the rights of the village and speak up against them bravely. In the jungle, there is no law and justice. Therefore, the village is in a safe mode because of having a brave person like her lashing out the fire of justice and peace. Moreover, she sends some native students to Insein Township with the help from her friends there so that they can pursue a good education in the high school and continue on to the College. One of the biggest problems in Late Pote Village is the land. The Karen villagers, for many years, are being oppressed continuously and their rights have been easily threatened by the greedy Burmese bandits over the land possession. They have always been cheated and treated unjustly in business, in jobs, and in living. The fact is that they do not understand about records and documentation to legally claim the land from the government to own it or to work for it. Otherwise, they will lose everything they possess in this country, in this land and will have to be displaced again and again. Naw Ka lu Paw is explaining to them about filling out the application in terms of having education in the future. Therefore, education is the spark of light they believe it right now with the help of Naw Ka Lu Paw to protect their rights. Another main concern for Late Pote Village is the healthcare. It is hard to travel from Late Pote Village to Nat Ta Lin town. The villagers use the traditional medication. Only a few people who know about modern medication will cure people in the proper way. There are trainers who got training under Dr. Myint Thein Tun in 2013, and six months training in Pauk Kaung by Mr. Hanson Chen with the help of Friends of Burma. There are no clinics, and medication equipment. There are plastic and waste here and there everywhere. Of all the crowded houses, there seems to be only fifteen toilets in the whole village. It proves that the village does not have healthy environment and sanitary system. Although, they are poor, they villagers are sincere, friendly, and helpful. They want their visitors to be comfortable staying with them. When I was there, they were fetching water for bath, hunting for food to eat, and cooking for us. I like chewing betel. Back then, one boy came rushing over to me and left a small pack of betel into my hands and ran away. I knew that it cost fifty kyats and I was surprised that the villagers cared for us and were polite. I am sure all these villagers are good people and kind. They listened to whatever we said. However, they need guidance and support. I am concerned about the traditional medication because some of the treatments are not properly done considered from the latest trends of medical treatment. With the help from FOMGB budget in 2014, I was assigned to give out eyeglasses to those who needed them. One of my friends, Ko Htay Aung, is an eye doctor. He helped me out delivering eyeglasses. Some of them were evangelists and most of them were villagers having trouble with eye sight. Even some of the people did not know what the eyeglasses were. Villagers from far and near came over to get the eyeglasses and some came down from very far walking through three mountains. When they put the eyeglasses on, they could see better and so they were happy. In fact, we had a hard time testing eyes because most of the villagers could not read the words. I have the pictures of the villagers with eyeglasses on. The rest of the eyeglasses will be sent to MICT and MIT. Finally, this trip was a success with the help of Tharawady Mission Association and many friends and relatives who came over to help and volunteer during the trip. 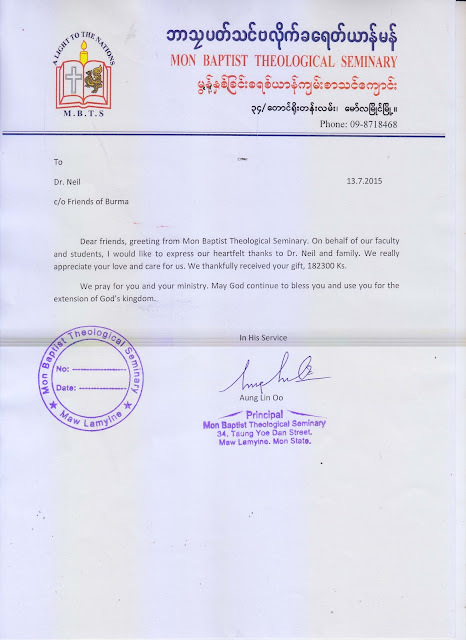 I have been interested in going to Bago Yoma since I attended KBTS in 2008. I will revisit the villages again in the future. Now we have founded Bago Yoma Care Committee given by Thra Taw Lu. It hopefully will be better to have several minds working on these problems. 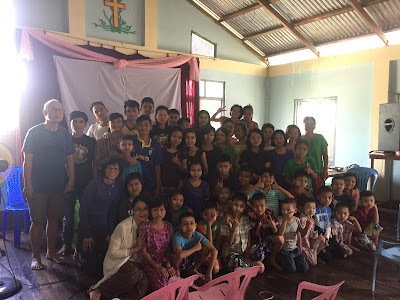 There are seven board members in Bago Yoma Care Committee including three senior Pastors from Tharawady Mission Assoication, Thramu Htoo Htoo and her husband, Thramu Mar Ku, and Thramu Wallace from MBC, who has many experience in mission field and developing programs. Our aim is to make progress and development in the isolated and barren places like Bago Yoma mission fields. We are also working together with Thra Taw Lu, Thramu Ka Lu Paw, and other volunteers. I am assigned to work as a coordinator and fundraiser in the committee. As you have seen from above, the major problems are: 1. Water supply, 2. Support so that people like Naw Yo Yo and Naw Ka Lu Paw can survive, 3. Education for the children, and 4. Medical care and training the local people. I believe that Friends of Burma is helping us a lot in making this project into reality and I hope FOB will continue to help upgrading the lives of the people in Bago Yoma as a partner in so many ways. We are very grateful for what you have done to help reaching out in many people’s lives. A very interesting article. I am going in februari to Myanmar and would like to visit Bago Yoma. The travel agencies do ask lots of money to get you there and I rather spend these dollars to the villagers themselves and I also prefer to travel without (tourist agencies). Do you have information how to get there, where to stay etc. and what would be the best to bring for the people of Bago Yoma? ?